True jade can be either of two different minerals, jadeite or nephrite. Both variations are tough, high polish stones that don't break or chip easily. We see so much green jade that it's easy to forget the gemstone occurs in other colors. Learn some more fascinating facts about this ancient gemstone and find out why it has been so consistently popular throughout the years. Jade has been around since prehistoric times. Our ancient ancestors carved jade into various objects to help with daily life, like weapons, tools, and objects used during rituals. Jade is considered the birthstone for the month of March as well as the zodiac sign Scorpio. Jade comes in two varieties, jadeite and nephrite. Jadeite is considered more precious and valuable than nephrite due to its deep colors and transparency. To some, jade is thought to increase the body strength and endurance of the wearer. In China, jade represents clarity and peace of mind. When Jade is carved, each shape also depicts a different meaning onto the stone. Jadeite is the rarer of the two jades, and the most expensive. Most of the world's supply of fine jadeite comes from Burma, but deposits are found in Guatemala and a few other areas around the world. Jadeite occurs in many colors, including green, white, lavender, yellow, orange, black and red. Evenly colored, translucent, emerald green jadeite is called Imperial Jade. Jadeite ranks at about 7 on the Mohs scale, compared to 10 for a diamond. Nephrite is more plentiful than jadeite, and that makes it less expensive. 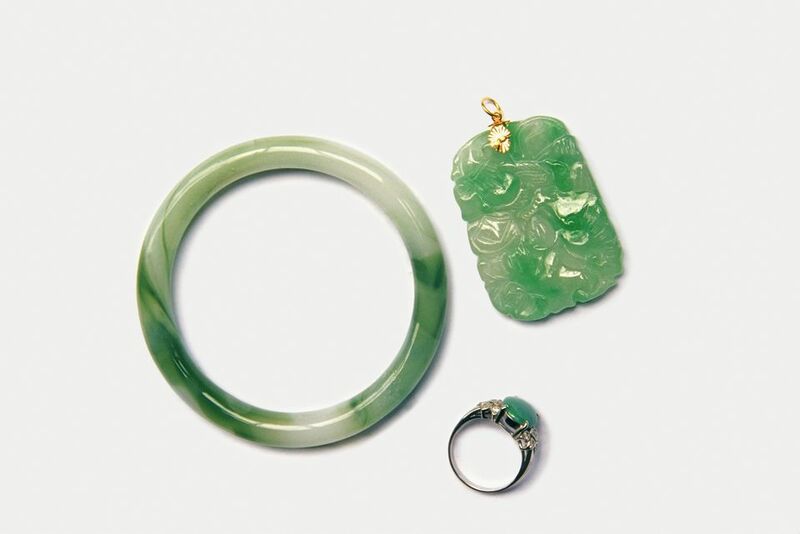 The Xinjiang Province in China produced the jadeite traditionally used by Chinese artisans until Burmese jade deposits became available in the 1700s. Nephrite deposits have been discovered all around the world, even in the United States. Nephrite jade is found in fewer colors than jadeite. Instead of bright emerald green, nephrite greens are often grayish or mottled. Nephrite ranks at about 6.5 on the Mohs scale. Because it is softer than jadeite, finished pieces cannot be as highly polished. Intense colors of jade are usually the most desirable. Deep and evenly toned translucent green is the most popular color of jade. Semi-transparent to translucent jade is more valuable than opaque jade. Avoid jade with many cracks or other visible flaws. Finely textured, highly polished jade cabochons and uncarved pieces of the gem are considered the most desirable components for jewelry. Jade is often dyed, but dying is not regarded as a permanent treatment. Heat treatments are used to lighten or intensify the color of jade. Color-intensified nephrite is sometimes marketed as jadeite. Be careful to know exactly which variety you're purchasing! Dishonest dealers alter and sell dyed quartz and other stones, labeling them as jade—buy from someone you trust. Jade can often be confused with similar gemstones like aventurine. Durable, rare jade gemstones have been a staple of cultures around the world for thousands of years. Because of this, it can make it difficult to determine when jade is authentic and when it is marketed and faked in an attempt to mislead the consumer. Be sure to ask a lot of questions and always deal with reputable jewelry companies.